A few years ago, I cut this short column out of the Washington Post. 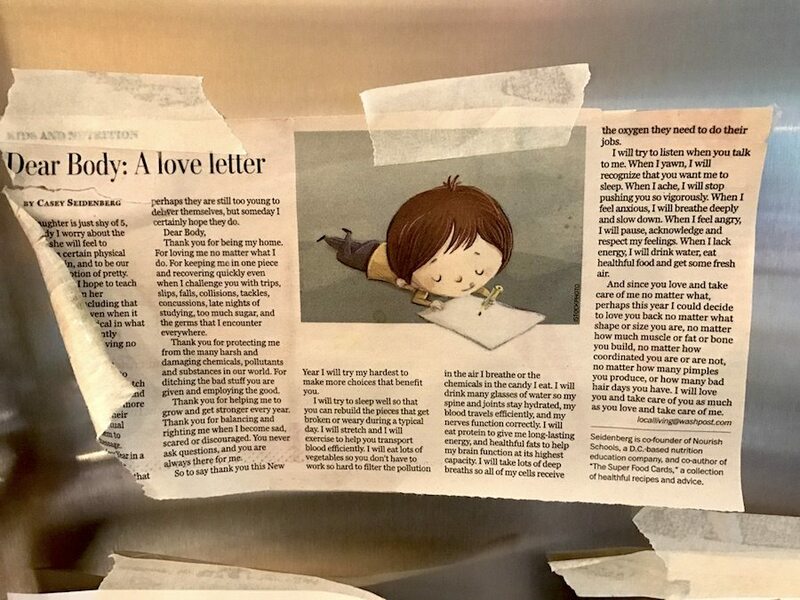 It was titled “Dear Body: A Love Letter.” I taped it up on our fridge, in the hopes that my children might see, and even read it. I thought it seemed like a great idea. And, it was. But maybe not for my kids. Maybe I taped it there for me. This year has, yet again, taught me that I need to slow down and listen inward. When I sat to listen, I heard all of the voices from inside of me that continue to measure me against some invisible perfect other. And let me tell you, I never won. Not once. “too many freckles and moles” or “not fit enough” or not thin enough.” Blah. Blah. Blah. This vessel that is my body is sacred. It is worth deeply caring for, and acknowledging the immense beauty and strength it (and all) possesses. So—I’m looking to write my body a love letter too. It might sound something like this. Thank you so much for all that you do for me. Thank you for giving me so much energy to practice yoga, to dance and make pottery, to play with my kids and husband, and to walk the dog. Thank you for giving me so much joy through taste, touch, smell, sound and sight… and so much more. I’m sorry for all the times I’ve run you ragged. I’m sorry that there have been many days when I’ve wished that you’d been different from what you are, because you are pretty incredible. Thank you for silently (most of the time) keeping things in such great working order. You are truly amazing—like a fine machine or the world’s greatest computer. If I had to be in charge of everything going on, I’m not sure I’d make it very far. I often look at my children marveling at what a miracle they are. I am also that miracle. So, here’s the thing. I love you. Even writing those words makes me cringe a little bit, as though this isn’t a good thing. This isn’t a superficial sort of love, but love in the best sense—a place of deep appreciation, openness, and care. I will strive to love you every day. I promise to do my best to take good care of you. I want you to be around for as long as you are happy. I will continue to eat well, which means less sugar and more veggies and herbal tea. It means that I will pause to take in the beauty of what you are capable of. It means that as I massage you each morning with my Ayurvedic oil, I will infuse that practice with real love and appreciation. I promise to get you just the right amount of activity, and lots of rest. I will also seek as much joy as possible, while minimizing the risk of injury and illness. And when you do get sick, I will rest and take even better care of you until you are well again. I will also sit. And listen in. To hear the messages that you are sending me so that I can better care for you. Thank you to Angela Farmer for inspiring this in me.